Bartholomeus Klip is unique. There are only five bedrooms in this small hotel, the original homestead on a large private estate which is both a working wheat and sheep farm and a nature reserve with a spectacular mountain backdrop. Here, in this unexplored region only an hour by car from Cape Town's international airport, you can feel part of the peaceful life of rural South Africa and its clean crisp air and star-filled night skies. The Victorian homestead has been meticulously renovated, and the fine fabrics and family antiques make you feel as if you are a guest in someone's much-loved home. Comfort is the keynote in the bedrooms: specially made pure cotton bedding, luxurious toiletries, towelling gowns. No TVs to spoil the country feeling (although there are two in the main rooms for essential viewing). Wild Olive House and its adjoining cottage, separately sited from the main Farmhouse, provide a self- catering option where children are welcome. 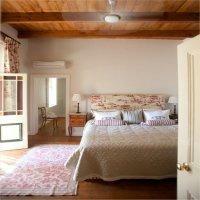 The Cottage has a bedroom, bathroom and small sitting room, with mini-fridge and facilities for making tea or coffee. You can watch the setting sun turn the mountains pink from your own private deck. The food is prepared in the French tradition but with a local flavour, is one of the highlights of a stay at Bartholomeus Klip. 4. Bookings made at shorter notice must be confirmed by full payment within 48 hours. 1.Check in time is 3.00 p.m. and check out time 12.00 p.m.
2.No guests under the age of 16 years. Luxury Rooms Sleeps 2 Includes: All Meals Rooms / Units: 3 Double bed which can be converted into 2 x single beds, aircon, fan,hairdryer, slippers, gowns. 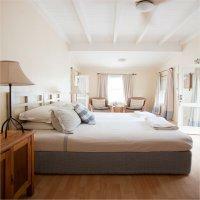 Orchid Suite Sleeps 2 Includes: All Meals King size bed, separate shower and bath, small lounge and veranda. Air con, under floor heating and fan. Disa Room Sleeps 2 Includes: All Meals King size bed, walk in shower, aircon, fan,hairdryer, slippers, gowns. My stay at this extraordinary collector's item of the Good Cooks and their Country Houses was incredible to say the least: from the glass of welcome bubbly on arrival to the intriguing fynbos game drives, from the Norwegian salmon to my high tea on a silver tray, from the starched white linen to the lavender on my pillow, from the refreshing swim in the crisp morning air to the thick bathrobe on my skin. I will definitely be back with my 5-year old, as the kids' cooking activities, bicycles and walks in the nature reserve will definitely be a hit with my girl! Bartholomeus Klip Farmhouse is 10.6km from the centre of Riebeek Kasteel , the nearest airport 71.6km (Cape Town International Airport).